The Buckingham Fountain is one of the world's largest. It is not named after Buckingham Palace. The fountain's benefactor, Kate Buckingham, dedicated it on May 26, 1927 as a memorial for her late brother, Clarence. Buckingham Fountain is paid for not by the city, but through the Buckingham Fountain Endowment Fund, which Kate Buckingham established so that Chicago taxpayers would never have the burden of fountain costs. The fountain received a $2.8 million restoration in 1994. Edward H. Bennett's design of Buckingham Fountain was directly influenced by the Latona Basin in Louis XIV's gardens at Versailles. The fountain and its beautiful four sea horses, built by Marcel Loyau, are meant to represent Lake Michigan. Each of the sea horses represents the four states that border the lake: Illinois, Indiana, Michigan and Wisconsin. The fountain is constructed out of Georgia pink marble. Buckingham Fountain on television: the fountain appeared in the opening credits of Married… With Children, and was the starting line for the 6th season of The Amazing Race. The fountain is powered by 3 pumps that push 14,100 gallons of water per minute through 134 water jets. The fountain holds 1.5 million gallons of water. The base of Buckingham Fountain is 280 feet in diameter. The fountain's lighting display is made up of 820 lights meant to convey an effect of "soft moonlight." The fountain is complete controlled by a "Honeywell Excel-Plus" computer located underground in the fountain's pump house. Until the 1994 renovation, the computer was located in Atlanta, Georgia. Buckingham Fountain is actually equipped with a security alarm, which is monitored by a security company in Chicago's Northwest suburbs. So now that you're armed with all of this knowledge about Buckingham Fountain, get yourself downtown and see it. 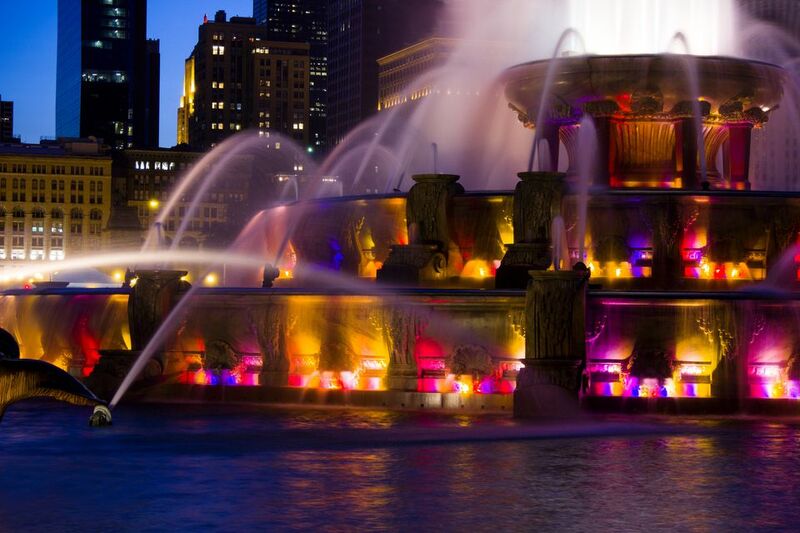 Read more in this Buckingham Fountain profile. Russian Tea Time, a Chicago staple since 1993, serves up Russian belly-warming classics, family-sized shareable platters, and vegetarian options. The restaurant is located right at the start of the Historic Route 66 marker, making it a fun Chicago experience. Consider visiting for their Afternoon Tea and Dessert, served with chunky metal Russian goblets full of piping hot tea. Chicago Athletic Association Hotel restaurants. The biggest draws at the hotel, which overlooks Millennium Park, are its dining and drinking establishments: Cindy’s, a rooftop restaurant and bar reminiscent of a Great Lakes beach house, and gourmet burger shop Shake Shack, a New York-based chain by famed restaurateur Danny Meyer, are two of its most popular eateries. 2 S. Michigan Ave.
Chicago Athletic Association Hotel: The property originally opened in 1890 as an exclusive men's club, but in its new life it operates as a lifestyle hotel catering to well-heeled men and women. It boasts 241 guest rooms, six dining and drinking establishments, an interactive game room, 17,000 square feet of event space, 24-hour fitness center, massive ballrooms and an indoor, full-size basketball court. Plus, you can even go rollerskating on the historic Stagg Court on select weekends. Embassy Suites Chicago Lakefront Hotel: Tucked into the southeast corner of Chicago's Streeterville neighborhood, the property is part of River East Center, a development that includes the hotel, luxury condominiums, an upscale bowling alley/lounge, a restaurant and a 21-screen movie theater. This location is ideal for tourists, as the hotel is within .5 miles from Navy Pier, Michigan Avenue shopping, River North entertainment district and the lakefront. Hilton Chicago: Situated directly across the street from Grant Park and down the street from Millennium Park, Hilton Chicago is one of the Windy City's most venerable hotel properties. It opened in 1927 and has played host to every president since its debut. It is also the third-largest hotel—by number of rooms— in Chicago behind Hyatt Regency Chicago and Palmer House Hilton. Loews Chicago Hotel: Located in the upscale, well-to-do Streeterville neighborhood, Loews Chicago Hotel is situated on the first 14 floors of the 52-story tower. It boasts many amenities for the leisure and business traveler, from spacious meeting rooms and spectacular city views to Rural Society--an Argentine steakhouse concept from "Iron Chef" champion Jose Garces.